Biodynamic Agriculture (BD) looks beyond the normal parameters of Organic farming by having strict management practices that are intended to restore, maintain and enhance ecological harmony. Biodynamic Agriculturewas developed in 1924 and was the first of the organic farming movements. In essence, it ticks all of the organic farming boxes, such as no use of chemical sprays, the farm must be largely self-sufficient, including feed, and animals should be born on a farm rather than bought at markets. Key practices within BD include crop diversification, the avoidance of chemical soil treatments and off-farm inputs generally. The Demeter Association certifying body recommends that a minimum of ten per cent of the total farm acreage be set aside as a biodiversity preserve (e.g. forests, wetlands, riparian corridors, and plants which attract insects). Diversity in crop rotation and perennial planting is required: no annual crop can be planted in the same field for more than two years in succession. Biodynamic farming is highly focused on the quality of the soil to improve the plants which grow and the animals which live on the land. This is considered as essential to raising the healthiest animals. To be certified as Biodynamic by Demeter a farm must show year-on-year improvement in the health of the soil. Biodynamic farming does not allow mono-agriculture, such as only having cattle or only chickens. Animal welfare and food consumed by animals are also highly important factors. The BD Preparation 500 and 501, are examples of Prep used under the Demeter certification. 500 is made from cow manure that has been packed inside a cow horn, buried over Winter and then dug up in Spring again. 501 is made using the same process as 500 but manure is not used but rather silica is packed into the horns and is stored over summer. 500 is created to beapplied to the soil and 501 is created for the etheric forms and applied into the atmosphere. Microbes and worms convert the manure/silica into a material that has the consistency of worm castings. The material is mixed with water and stirred in according to a specific vortex pattern. 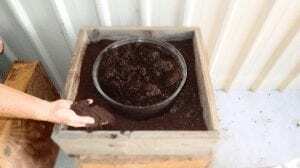 Applying the liquid to the soil inoculates it with soil microbes and energetic life forces that quickly multiply when the conditions are right. The microbes convert organic matter and minerals in the soil into plant available nutrients, which is why plants flourish. Image: The Prep 500 is stored in the bucket surrounded by peat moss.